With a well-crafted outdoor structure as a part of your landscape, your yard is sure to have function and curb appeal throughout the warmest months of 2019. Spring is the perfect season for spending time outside and enjoying your outdoor space! Why not incorporate a beautiful gazebo into your landscape this year? With a well-crafted outdoor structure as a part of your landscape, your yard is sure to have function and curb appeal throughout the warmest months of 2019. As you are preparing your landscape for spring entertaining this year, consider these four reasons to add a beautiful gazebo to your yard this spring. 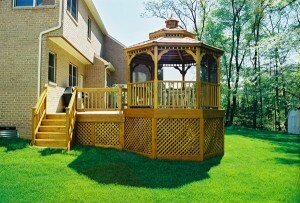 No matter which color or style you choose, your new gazebo is sure to enhance the look of your landscape in any season. Let a floral gazebo design transform the look of your yard into a whimsical garden, or install a clean, wooden structure for a polished look in your landscape. When you choose to work with Mid-Atlantic Deck & Fence for your gazebo installation, you can choose from a variety of colors and styles that are sure to enhance the look of your landscape. With a new gazebo to sit in and enjoy on a beautiful day, you can extend your outdoor living space to the comfort and shade of a great outdoor feature. Not only will your new gazebo sit beautifully in your yard, but it will also add function to your outdoor living space as a place for you and your family to enjoy this spring. Whether you are hosting Memorial Day weekend or a small get-together with friends, your new gazebo will also provide your guests with a space to enjoy on any occasion. Extend your seating space and your shade coverage with a beautiful gazebo in your yard. Let your gazebo not only become a visually appealing accessory, but also an extension of your seating space for guests. Once your new gazebo is installed, you have an opportunity to decorate your gazebo as a new part of your landscape. Dress up the look of your new outdoor structure with flowers, hanging baskets, and other fun accessories that will create a beautiful space in your yard for the year. Call Mid-Atlantic Deck & Fence For Your New Gazebo in 2019!